Clan Members descended on the village of Ceres, in the hear t of “Lindsay of the Byres” territory, close to Struthers Castle for this year’s Gathering in Fife. The proceedings commenced on Friday evening and those who were able, made their way to the “Lindsay Vault” in the churchyard of Ceres Parish Church where the open door of the little stone mausoleum revealed the candle lit tomb of the 20th Earl of Crawford and his young wife Jean, elder daughter of the Duke of Atholl. The Clan Piper played the lament “Lindsay’s Lament” and a beautiful wreath of Rue, Lime Leaves and Heather was placed on the Earl’s tomb by Scott Lindsay, the Society’s Chairman. 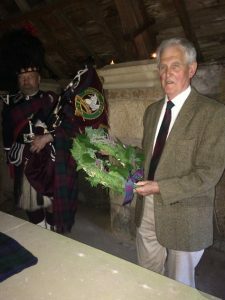 The Society was very pleased this year to give a warm welcome to two special guests from overseas; Susan Cooke from the Clan Lindsay Society of Australia and Joe Lindsey from the Clan Lindsay Association, USA, who both attended the ceremony. 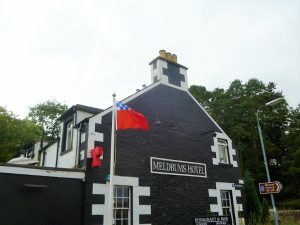 Clan Members then retired to dinner in the nearby Meldrums Hotel where the Lindsay colours were to remain proudly and firmly fixed to the hotel’s flag pole for the duration of the Gathering weekend. Iona Lindsay on behalf of her father the Earl of Crawford, who himself was very sorry that he could not be present; Jamie Lindesay-Bethune, Lord Lindsay, represented the Lindsays of the Byres, who were very much the focus of the day’s events; and, Sir James Lindsay represented the House of Dowhill. Following lunch, the Gathering split into two groups. 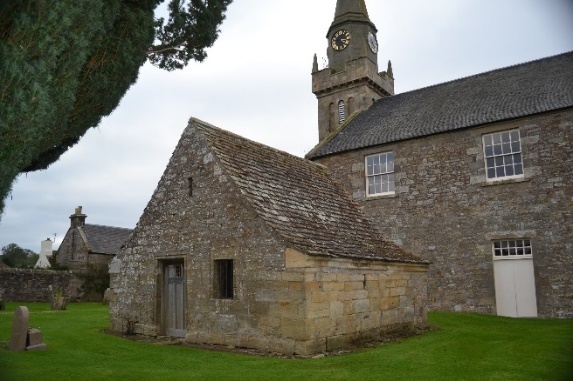 The first group made their way to the Lindsay Vault where they were met by Diarmid Lindsay who explained some of the background to the Lindsay ancestors buried in the churchyard and in particular to the life of John Lindsay, 20th Earl of Crawford and 13th Lord Lindsay of the Byres. Diarm id then took the group into the Parish Church past the effigy of a medieval knight in the entrance porch. The identity of the effigy is unknown but has been reliably dated to a period which corresponds to the lifetime of John Lindsay, 1st Lord Lindsay of the Byres (b. circa. 1402 – d.1482). Inside the church itself, it was noted with great interest that the interior had been redesigned in the 1950s by the Architect Ian Gordon Lindsay. Ian was a former Member of our Society joining in 1926 and latterly serving on the Board of Management until his death in 1966. 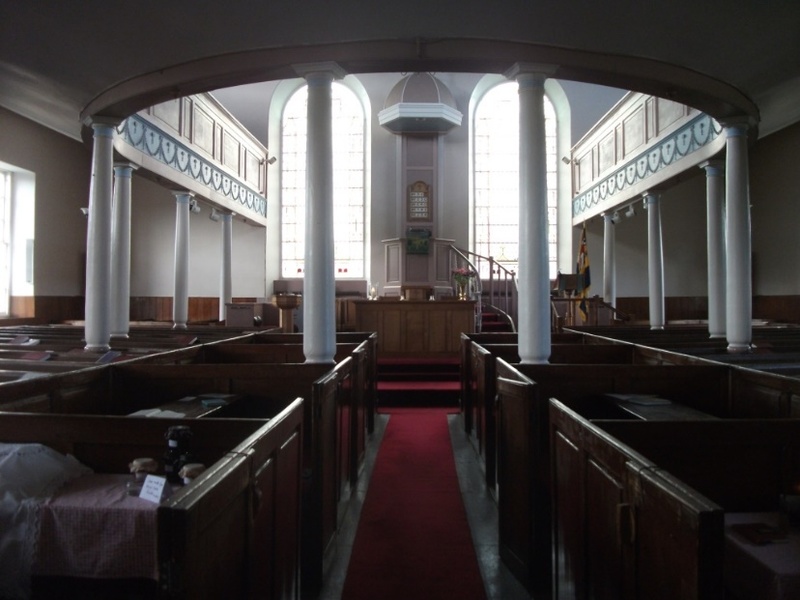 The interior layout is of an unusual design and is such that the pews can be rearranged to construct two communion tables down the centre of the church when required. While the first group was at the church, the second group made their way to the Fife Folk Museum in the centre of the village. Mary Rose Lindsay was there to introduce the group to a local volunteer museum guide who provided valuable knowledge of the exhibits. 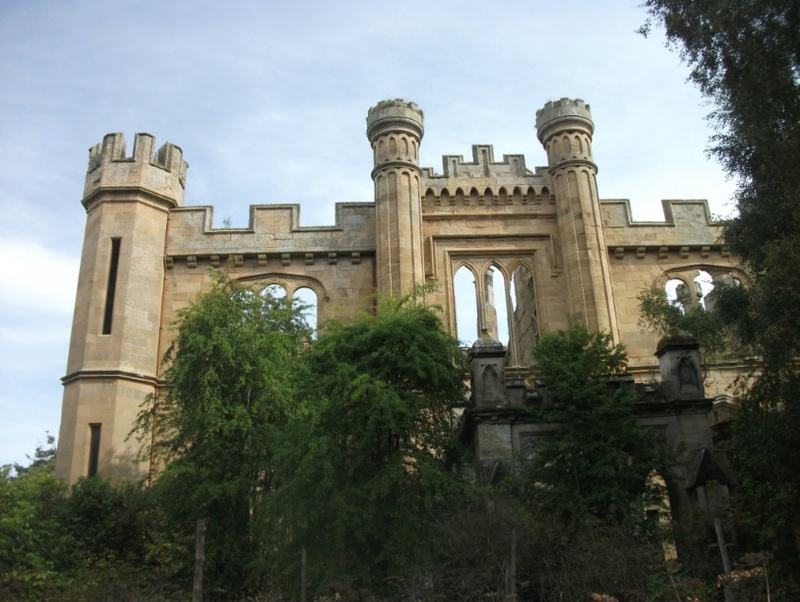 The main focus of interest was on the history of Struthers Castle and the influence of the Lindsay Family who acquired the lands of Struthers in 1392 following the marriage of Sir William Lindsay of the Byres to Christiana Keith, daughter of Sir William Keith, Marischal of Scotland. Of particular interest was the Craigrothie drum bearing an adaptation o f the Coat of Arms of the Earl of Crawford. It shows an ostrich with a key in its beak, appropriate to the Lindsays of the Byres, and the moto Endure Fort. The supporters, however, seem to represent local dignitaries rather than the traditional lions. We were particularly grateful for the additional information provided by Bob Scott, a local writer and historian, who is very knowledgeable on the Lindsay history in the area. Bob was joined in the museum by Hugh Stewart, another well informed Lindsay enthusiast, who’s family have owned Struthers Farm and the adjoining ruins of Struthers Castle since 1919. We were very grateful to both these gentlemen for showing their interest and their willingness in coming along to speak to us on Lindsay related matters during the afternoon at the museum. 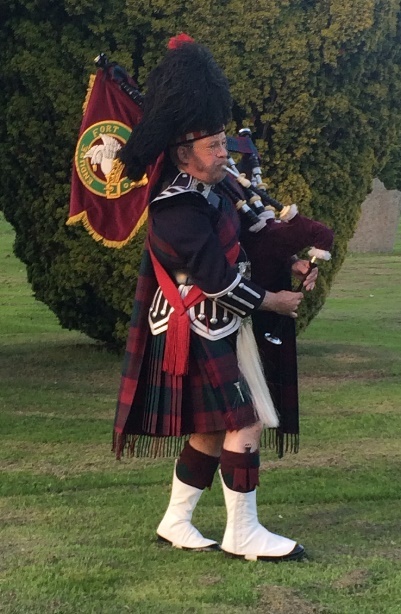 On leaving the museum Members were encouraged to take the route back to Meldrums Hotel past the Bannockburn Monument. 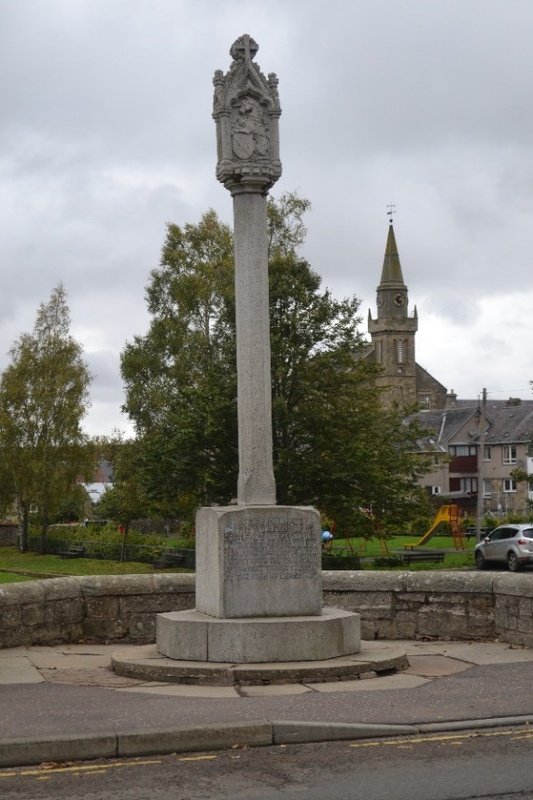 This monument was unveiled by the 27th Earl of Crawford (“Private Lord Crawford”) in 1914 to commemorate the 600th anniversary of local men from Ceres who took part in the famous battle. By the time both groups had exchanged respective venues, it was fast approaching 4 pm when the hotel had arranged to provided coffee and tea with cream scones and strawberry jam. Following this a number of the attendees, unfortunately, had to leave to make their homeward journeys. 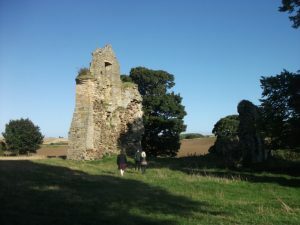 Those remaining Members, who still had enough energy left, followed Hugh Stewart to nearby Struthers Castle for a quick visit in the late afternoon sunshine. Sadly, there is not a lot left of th is stately home which was more or less abandoned following the death of the 20th Earl of Crawford in 1749. A large portion of gable wall fell down in 1968 and moves are now afoot to try and preserve what still remains to make it safer for visitors. Returning to Ceres, the next port of call was the Ceres Inn where refreshments and a menu of fish and chips, steak pies and burgers was on offer. Suitably sustained we were joined by Fife folk singer, Helen Millar. Helen had previously sung in the Ayr Gaelic Choir with Isla and Mary Rose back in their old schooldays. Such familiarity provided the catalyst for some lively communal singing of many well-known rousing choruses. Solo contributions from Ronnie, Lin and Mary Rose were interspersed with poetic recitations from Robert Lindsay Hodgart and a selection of tunes from Scott Lindsay on the small pipes. A great evening was had by all. Sunday morning was bright and sunny. A diminished party met at the Meldrums Hotel around about 10 am and again split into two groups. 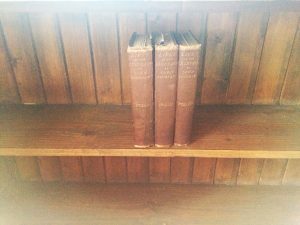 One group went straight to Colinsburgh to visit the “Lindsay Cupboard” in the Galloway Library and the other group embarked on a “whistle-stop-tour” of some nearby local Lindsay sites. The first stop was Lordscairnie Castle. This was not a “Lindsay of the Byres” castle , although only a few miles north of Struthers. It belonged to “Earl Beardie” from the Angus Lindsays. 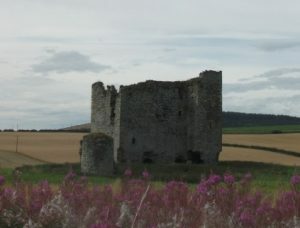 The castle is in a very dangerous condition and the party were only able to view the remains from a distance. Next stop was the farm house built on the site of the house owned by the famous poet and playwright, Sir David Lyndsay of the Mount, Lyon King of Arms. A large number of stone outbuildings may still harbour Lindsay relics, but we only had time for a brief stop and saved a detailed search for another occasion. estate was then passed to George Boyle, 4th Earl of Glasgow. 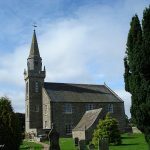 George was descended from Patrick Lindsay who married Margaret Crawford of Kilbirnie in 1664 and changed his name to Crawford. Their eldest daughter, also called Margaret Crawford married David Boyle, 1st Earl of Glasg ow, in 1687. Crawford Priory started to deteriorate from neglect during the 1970s and, eventually, was irreparably damaged by fire in 1995. 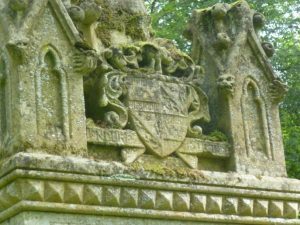 On leaving the grounds of the Priory we stopped to look at the sundial incorporating the armorial bearings of the associated families, including the Coat of Arms of the Earl of Crawford. The exploration party then returned to Ceres and, those who were able, continued on to visit the Colinsburgh Galloway Library for the official opening of the “Lindsay Cupboard”. The first visitors to the Library had already left before the second party arrived. 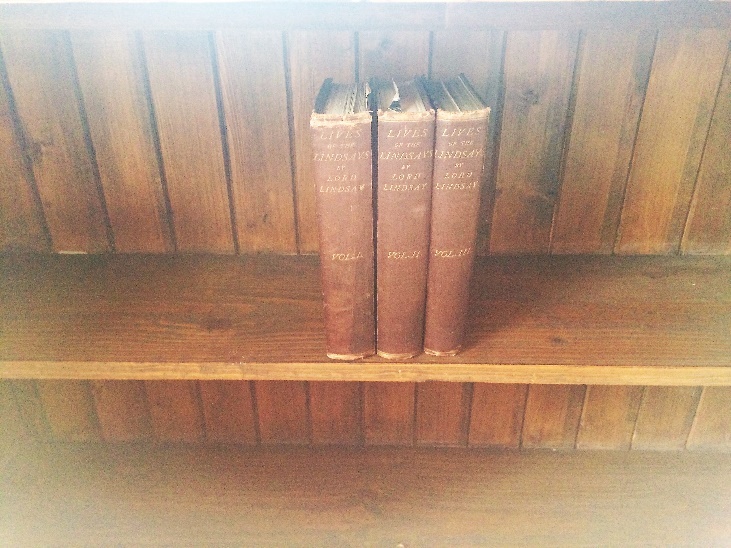 The cupboard was opened and the first books to be placed in the cupboard were the three volumes of the “Lives of the Lindsays” that had been bequeathed to the Society by Ian Crawford Lindsay of Carnoustie in 2010. Other publications and documents from the Secretary’s store room soon followed. At this point Mary Rose and daughter Helen served up most welcome cups of coffee, tea and biscuits in the Library before the last of the Lindsays departed, following a very full and concentrated three day Gathering of the Clan in Fife. Special thanks to Lady Iona, Jamie and Sir James representing the Fife Lindsay families: and also, best wishes to Susan and Joe. Many thanks to all who attended and contributed to such a wonderful Gathering. The Gathering this year will be held in the village of Ceres, which is situated at the heart of the Lindsays of the Byres territory in Fife. Please gather for lunch at 12 noon, for a 12:30 start. Lunch will be served at the Meldrums Hotel. This will be followed by a visit to the newly renovated and expanded Fife Folk Museum. 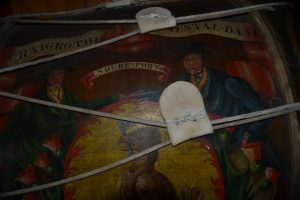 The museum features information on Struthers Castle and other Lindsay connections including, in particular, the Craigrothie drum. Afternoon tea will be served back at the Meldrums Hotel around 4pm and it is anticipated that a musical evening with local guest artists will be arranged in the nearby Ceres Inn, where bar meals are available for those in need of further sustenance, along with liquid refreshments, until late. For those staying overnight, it may be possible to attend the local church service or arrange a whistle-stop tour of Lordscairnie Castle, The Mount, Crawford Priory and Struthers Castle. These are all within a five mile radius of Ceres. 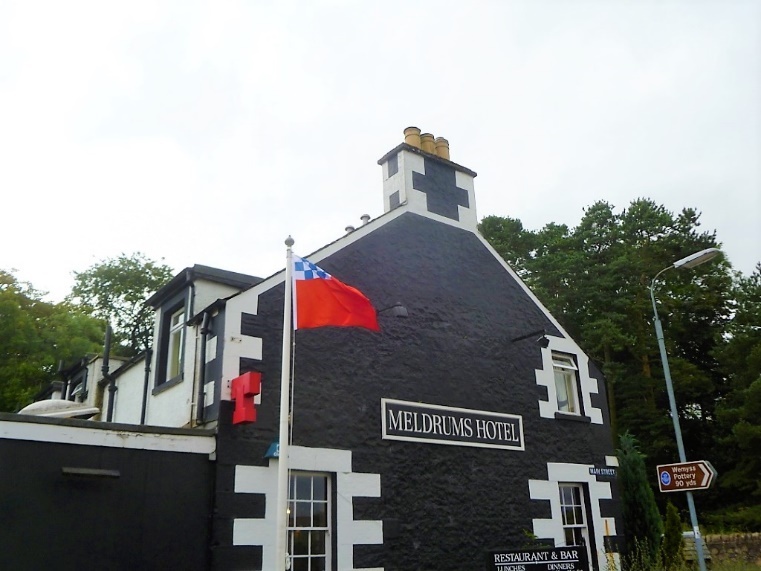 Meldrums Hotel is situated close to the Parish Church which was built in 1806 by Alexander Leslie on the site of a much earlier building. The interior was restored by the architect Ian G Lindsay (1906-1966) in the mid-twentieth century. 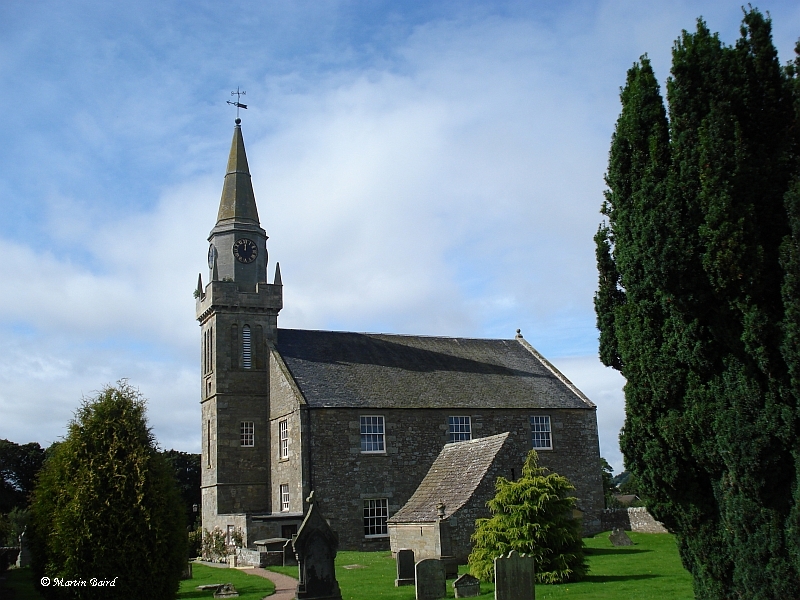 The church was historically the place of worship of the Lords of they Byres from Struthers. There is a vault in the churchyard dedicated to the Lindsays in which lies the remains of the 20th Earl of Crawford, his wife Jean and a number of other Lindsay family members. 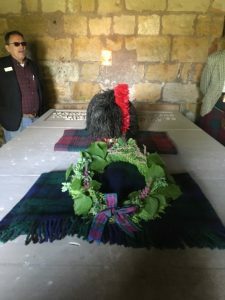 The 20th Earl of Crawford was the first Colonel of the Lindsay-Crawford Regiment which later became the Black Watch. 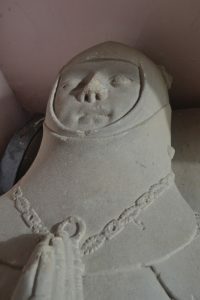 In the vestibule of the Ceres Parish Church is an effigy of a medieval knight whose identity is unknown. It is highly probable that this is a Lindsay, forgotten after 1808 when the 22nd Earl of Crawford died without heir and the direct line of the Lindsays of the Byres was temporarily terminated. The title of Earl of Crawford lay dormant until 1848 when it passed to the Lindsays of Balcarres. Another site worth visiting in Ceres is the Bannockburn Monument erected in memory of the men of Ceres who fought in 1314. The memorial was erected and unveiled by the 27th Earl of Crawford in 1914 at the beginning of WW1. This was of course Private Lord Crawford whose diary you will surely have read. Includes lunch, museum entry and afternoon tea.